Secur&Clean Solid Safety Cover keeps pool clean while protecting it from accidental intrusion by children, pets or stray animals. GLI Safety Covers meet or exceed ASTM standards as set forth in ASTM F 1346-91. Secur&Clean Solid Safety covers have 12 year limited warranty. 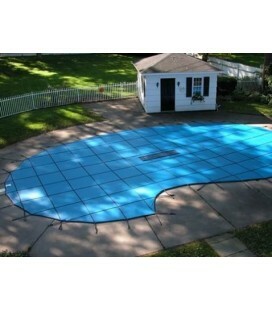 Secur-A-Pool Covers are available in blue and green. Our Secur&Clean Safety Cover is renowned for its strength, durability and ease of installation. It offers solid safety cover protection without the cover pump. Secur&Clean Safety Covers meet or exceed safety cover performance standards as set forth in ASTM F 1346-91. Contact the Pool Experts at 855.205.7139 to customize your pool kit with options & GUARANTEED best pricing! New and Improved vinyl coated fabric - for improved strength and tear resistance! Keeps pool clean while protecting it from accidental intrusion by children, pets or stray animals. Made from tough, long lasting vinyl laminated polyester fabric. Comes with patented Kleen-Screen drain. Drains water from surface - filtering out dirt, leaves and debris. Also available with NEW & IMPROVED Sure-Flo full length drain! This better than ever drainage option allows for better water flow through the drain while still providing the ultimate in sun blockage. Pull-Tite Commercial Grade springs come standard on all custom ProMesh and HyPerLite covers and are available as an optional upgrade on other custom covers. They provide increased durability and performance, plus have a lower profile so covers lay latter & keep dirt out when the winter winds blow. All covers are constructed with heavy duty polypropylene webbing and UV treated polyester thread. Strong enough to support the accidental intrusion of a stray animal or even a small car. Secur-A-Gap provides your cover with the perfect fit around protruding pool elements such as, rock features and waterfalls, without the loss of security that your safety cover provides. GLI has the solution for everything. With standard pools being a thing of the past, GLI has crafted solutions, such as, wall mount anchors to make covering even the oddest shapes and edges possible. The Sure-Flo drain is created using ProMesh fabric that runs the full length of the pool, down the center of the cover, increasing the surface drainage area while blocking sunlight, dirt and debris from getting into your pool. The Sure-Flo drain option is ideal for custom shape pools or larger rectangles. The patented Kleen-Screen drain filters dirt particles (as small as talcum powder) and still allows water to drain through, ensuring a safe pool in the off season and a CLEAN pool on opening day! Comes standard with Solid Safety Covers.